I would like to plan a day or evening event at The Old Mill Clubhouse. Where do I begin? 1. Call or email to check the availability of your desired time & date. Let us know what type of event you would like to plan, the date you are looking to reserve, the tentative time frame and the tentative number of guests. We will get back to you within one business day to answer all your initial questions. 2. Stop by and view the facilities to ensure that our space will accommodate all your needs. During the golf season, the building is generally open dawn to dusk. You may drop in anytime, without an appointment, to look at our Banquet Facilities during the golf season. When the golf season ends, it is important to make an appointment with our banquet coordinator to view the facilities. 3. Once your decision has been made we will ask for a deposit to secure your desired date and time. After the confirmation of your date, you and the banquet coordinator can begin making your plans. Menus need to be confirmed no later than 14 days in advance of your event date and the number of guests needs to be guaranteed no later than 7 days prior to your event. Are you one of those facilities that charge for every table and chair, napkins and servers, plates and glasses for banquets? We provide all the table and chairs, service ware and wait staff. For nighttime events, we provide white linens for all the guest tables and buffet tables. Additional optional costs may include specialty linens, a bartender, ceremony fees, flower service, dance floor rental, additional hours rental charges, and patio set up fees. You may provide your own decorations and centerpieces or we can provide a minimal flower and candle service. Check with the banquet coordinator for all decoration plans, as some restrictions apply. For daytime events, we provide tables, chairs, wait staff and paper napkins. Linens can be added to daytime events for an additional fee. We would like to have a meeting and no food or beverages. Is this possible? May we bring in our own food or our own caterers? We provide all your food and beverage needs for any type of event. We are operating on a very tight budget for our wedding reception. How much is our reception going to cost? Each wedding party has varying needs, a number of guests and budgets. We have a banquet coordinator that can help you plan within your budget. Keep in mind there are food and beverage minimums. These food and beverage minimums are lower Sunday through Thursday and go up on Friday and Saturdays. I noticed that there is no mention of full bar service in any of your information packets. We have an on-premise beer license and can provide beer for your gathering. We also permit liquor store product to be brought in, limited to wine and heavy beer only. We do not charge corkage for beer purchased through The Old Mill Clubhouse but do charge a corkage charge for liquor that is purchased off the premises. A mandatory bartender fee is charged when any beer or wine is served for your event. I see lots of activity at the Old Mill Golf Course and The Old Mill Clubhouse during the golf season months. Are you also available for events during the winter months? We do custom luncheon and dinner banquet events throughout the winter months. Our Grill, however, closes at the end of the golf season. Is your Grill Room just for golf tournament players or daily golfers? Our Grill is open daily during the golf season and everyone - golfers, business people or a girl’s lunch out - is welcome to enjoy a breakfast, lunch, snack or beverage in our Grill Room or on the patio. Can you take our reservations for a golf tournament? All golf tournaments are booked through our Pro Shop. After securing your golf tournament dates, drop us an email or give us a call and we can take care of all your golf tournament food and beverage needs. For a golf tournament, can our sponsors provide food and beverages to our participants? Food and beverages can be purchased by your sponsors through The Old Mill Clubhouse Banquet Services and distributed to your participants. 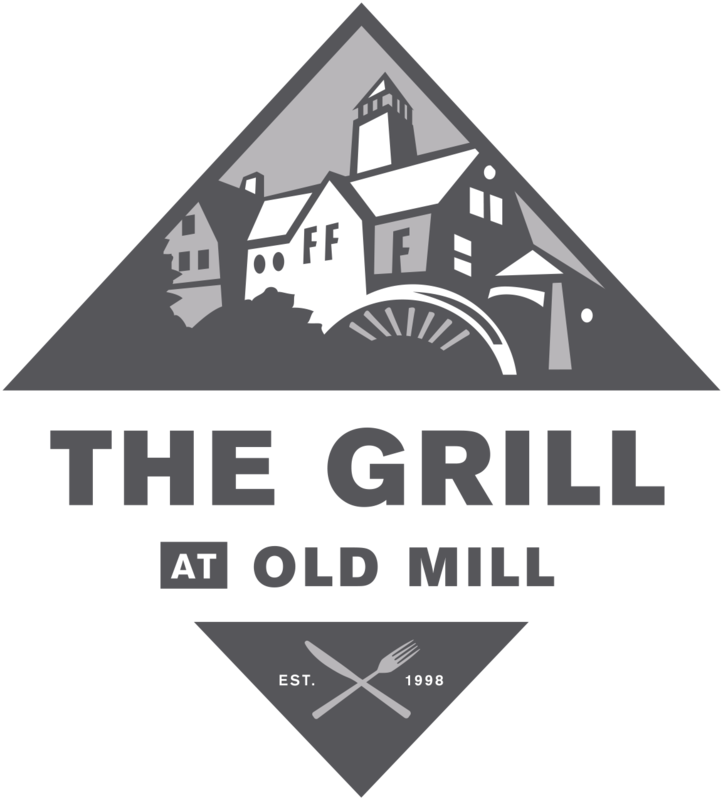 However, no food, beverage or alcohol purchased off the premises is permitted on The Old Mill Golf Course or in The Old Mill Clubhouse. Discuss all your pre-tournament meals, snacks and beverages on the golf course, and your post-tournament banquet needs with our banquet coordinator.